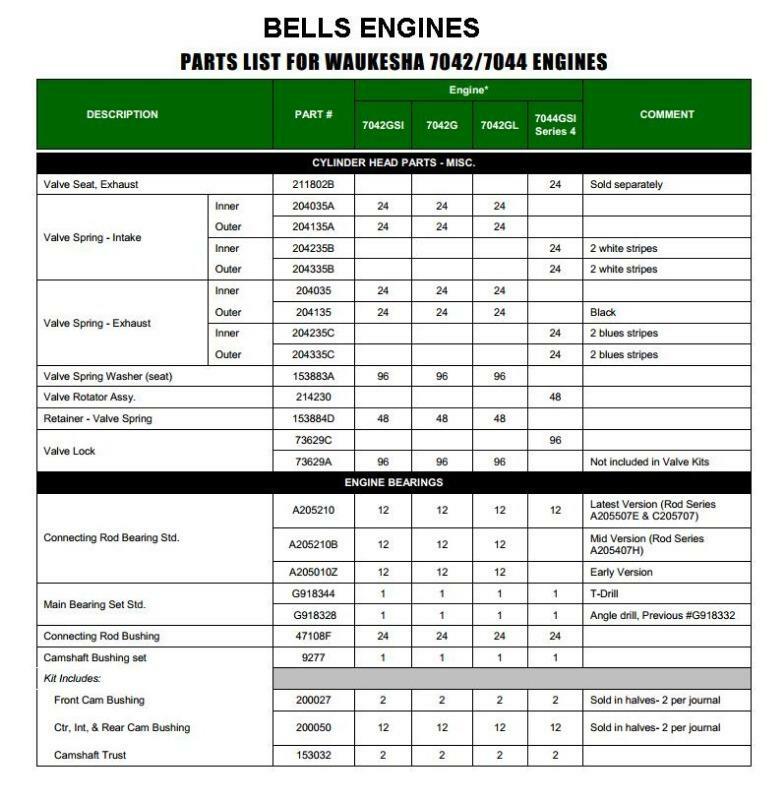 Bells Engines are experts in off-shore and on-shore gen-set and engine reconditioning services for Waukesha® applications. We can arrange receipt and distribution of engines and parts to and from our our workshops and we can supply reconditioned engine products to offshore installations throughout the West Coast of Australia. 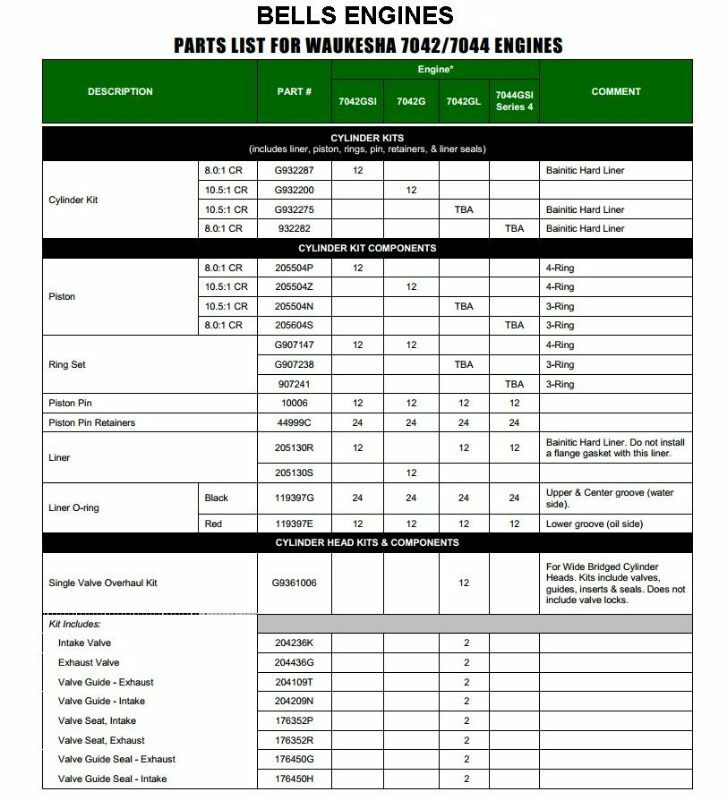 We can also receive your Waukesha® generator sets or engine applications and recondition them to as good as new for fast delivery to your installations. Bells Engines provide cost effective quality without risk to engine life or performance. We also have a long history with our manufacturing partners who are internationally renowned manufacturers of Waukesha overhaul kits and components. 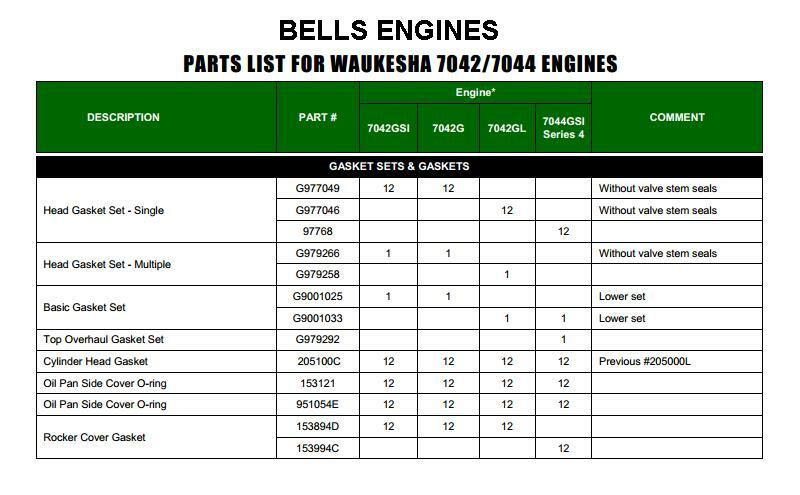 Listed below are some highlights of Bells Engine's new product line for Waukesha 7042/7044 engines. We have a long history with aluminum pistons. From engineering to reconditioning and distribution. Bells know the business. Our new Waukesha 7042/7044 pistons are engineered to perform. Special Ni-resist austenitic material is tightly bonded metallically to the piston body to counteract wear in the top ring groove. The rings work together to improve wear resistance, provide better oil control, and reduce blow-by of exhaust gases. The top compression ring features a special tapered upper profile with lower offset barrel shape for better ring-to-sleeve wall contact. As per our rigid quality standards, Bells Engine's Cylinder Liners are also engineered to precise tolerances ensuring high quality and performance. A special bainitic iron/chromium alloy material is used that includes a matrix of carbon, silicon, molybdenum, and nickel to provide tensile strength exceeding 55,000 PSI. At Bells Engines we are well known for very high quality valvetrain components. Our valvetrain components for Waukesha® applications are engineered to rigid engineering specifications, specifically for spark ignited engines. - Valves made of high grade alloy steel, with added Chromium and for corrosion resistance. Special austenitic nickel chromium super alloy material used for specific applications. - Valve Seats specially engineered with a Stellite® cobalt base, cobalt-chromium alloy material for enhanced durability and wear resistance. - Other valvetrain parts available include Valve Overhaul Kits, Rotator Assemblies, Springs, Retainers & Locks. We offer a wide range of components for Waukesha® and Caterpillar® spark ignited engines. From Connecting Rod and Main Bearing sets, to Connecting Rod and Camshaft Bushing sets, to Gasket sets…. Call Bells Engines today on 08 9581 7944 and ask for a quote. 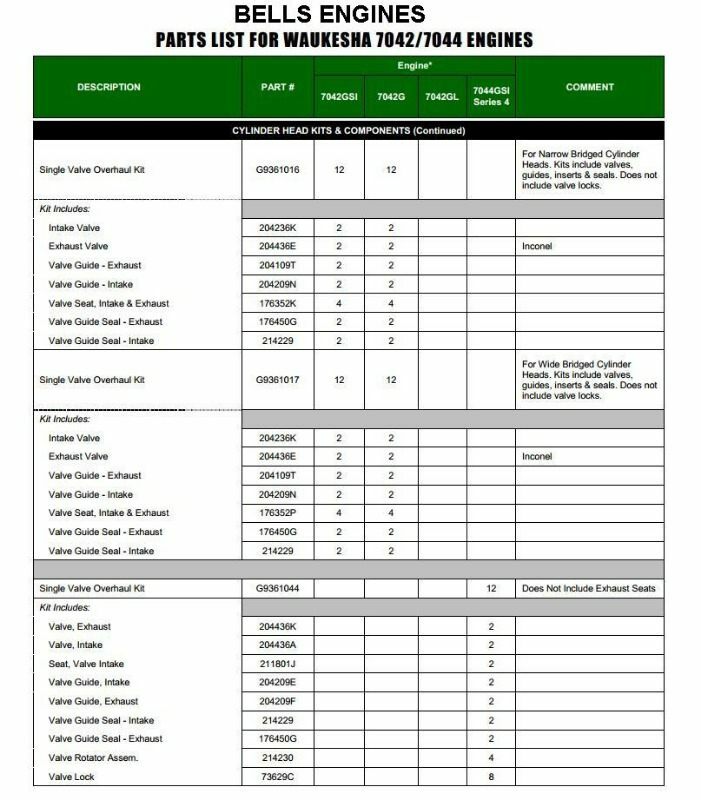 Please guide you cursor over the parts lists below to magnify them for detail.